Humanity has had a long fascination with blood sacrifice. In fact, it has been by no means uncommon for a child to be born into this world only to be patiently and lovingly reared by religious maniacs, who believe that the best way to keep the sun on its course or to ensure a rich harvest is to lead him by tender hand into a field or to a mountaintop and bury, butcher, or burn him alive as offering to an invisible God. The notion that Jesus Christ died for our sins and that his death constitutes a successful propitiation of a “loving” God is a direct and undisguised inheritance of the superstitious bloodletting that has plagued bewildered people throughout history. . .
Start reading Letter To A Christian Nation on your Kindle in under a minute. Sam Harris is the author of the New York Times best seller, The End of Faith: Religion, Terror, and the Future of Reason, which won the 2005 PEN Award for Nonfiction. He is a graduate in philosophy from Stanford University and has studied both Eastern and Western religious traditions, along with a variety of contemplative disciplines, for twenty years. Mr. Harris is now completing a doctorate in neuroscience, studying the neural basis of belief, disbelief, and uncertainty with functional magnetic resonance imaging (fMRI). His work has been discussed in The New York Times, The Los Angeles Times, The San Francisco Chronicle, The Economist, and New Scientist, among many other journals, and he has made television appearances on The O'Reilly Factor, Scarborough Country, Faith Under Fire, and Book TV. A flawless account of the ridiculousness of organised religion. One logical blow after another, this book should make any person of faith take a long hard look in the mirror. Insightful. Polite. Well argued. Despite this it will not sway those with dogmatic views who need the comfort of a superior master to direct thir lives. A good work for young adults to check their beliefs and inherited teachings. Those with open free minds will find this letter informative and thought-provoking. Well worth a read even if you don't move your views. 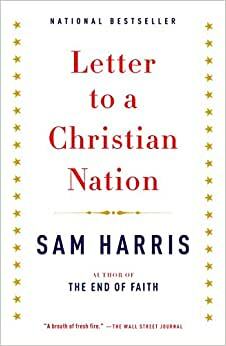 Another short, yet great read constructed by the brilliant Sam Harris. I love that it is short and to the point, hitting each topic like an arrow through the bullseye. I really enjoyed Letter to a Christian Nation 5 stars.